Smart boosted their Gadget Plus Plan portfolio from 2 devices in 1 plan to 3-in-1 offers. Get 3 devices in just 1 postpaid plan for only 999, 1299 and 1599 monthly service fee. You can choose 1 tablet, 1 smartphone and 1 USB broadband or Smart Bro Pocket Wi-Fi all that in one package. Wait there is more, you will also get 50 hours of internet surfing via Smart 3G connection and unlimited TRI-NET texts. You want more?, they also included SmartNet Social Stream where you can get free Facebook and Twitter using mobile web or the Android app. As mentioned above you one unit on their variety of tablet, 1 Android smartphone and 1 broadband to complete this 3 in 1 Gadget Plus Plan. But wait we forget something , they also offer laptops as an options to choose in add addition to tablets. You can now select a laptop instead of tablet in completing your 3 gadgets in one plan. Another additional tablet you can choose on the Gadget Plus 3-in-1 Plan is the new LG G Pad 8.3 tab. Once you already selected your desired gadgets it doesn't end there, you can also enjoy the bundled network services from Smart listed below. 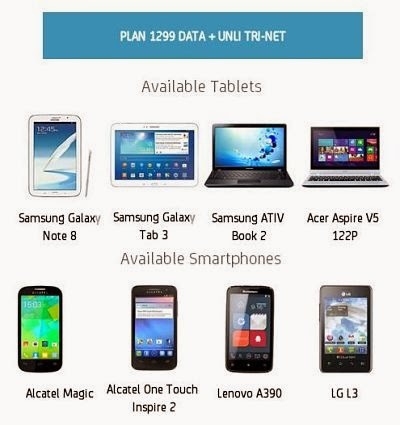 If you want a lower plan but still you need a 3 gadgets you can also apply Gadget Plus Plan 999 where you can select their set of tablet categorized for this plan. For device number 2 and 3, you can select the same choices above plus the same network services also. 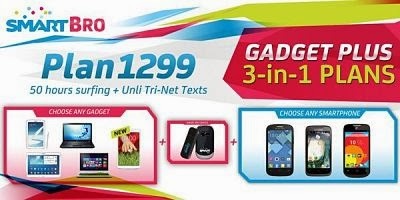 For more details, you can visit www.smart.com.ph or visit your nearest Smart Store now. wala ba tong cash-out or one time fee?? ?